After a long chilly week the sun was shining and the temperatures were up and brought in a crowd to fill the bleachers of Holstein enthusiasts to the 2017 Minnesota Spring Special sale at the Olmsted County Fairgrounds in Rochester, MN. The sale was held on Saturday, April 8. 2017. At the sale 106 live lots were auctioned off and included three half lots. The sale averaged $2,140 on all the lots. The 2017 Spring Special sale also offered an online/onsite embryo auction. 9 total lots sold with an average of $966 per embryo lot. 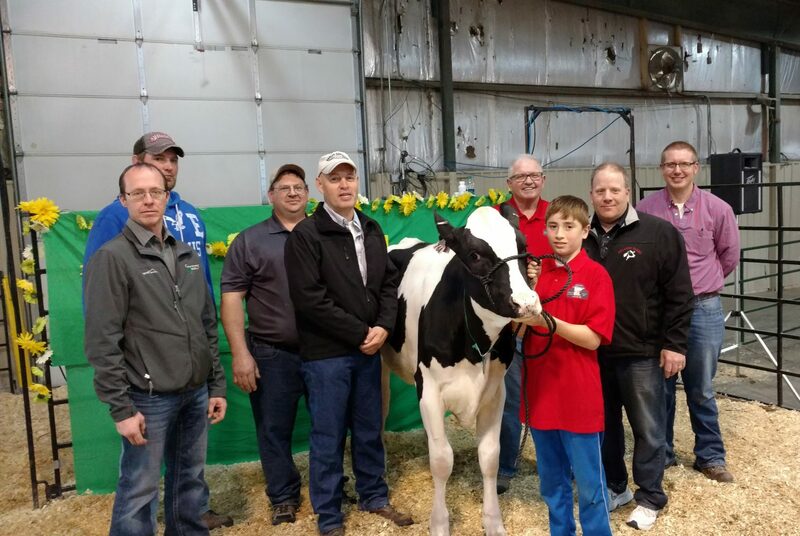 (LtoR) Scott Courtney, Ringman, Matt Timmer, Sale Co-Chair, Tracy Schaefer, Sale Chair, Jim Vierhout, RIngman, Heifer – Hartford Josuper 764 Leslie with Bob Eustice’s grandson, Bob Eustice, Consigner, Spencer Hackett, Buyer, Jeremy Schaefer, Auctioneer. The high seller of the day was lot 31 Hartford Josuper 764 Leslie, consigned by Robert Eustice, Byron, MN. She was purchased for $7000 by Melarry Holsteins, Rice, MN. The second high seller was lot 1 Sheeknoll Sid Tophatt-ET consigned by Sheeknoll Farms, Rochester, MN. She was purchased for $5,600 by Austin Yoder, GA. Thank you to all who participated in the MHA Spring Special sale and helped make it a success. Thank you to all buyers, bidders, consignors, selectors and sale staff.